In our last article, we talked about how to set up a traditional desk and office chair for proper posture. Before you run out and sink money into a exotic workspace solution to improve your posture, you may want to make sure that your existing workspace is properly configured. Sometimes, a simple solution may be sufficient to get you back to proper posture and pain-free hours at work. Still, sitting for 40+ hours a week isn’t really something for which our bodies are designed, and if your budget (or your employer’s budget) permits, you may want to check out some of these options to help your body maintain proper posture during your workday. If you’re at work in an office right now, take a quick look around. How many people are practicing good posture at their desks? Probably not very many, but there’s a good reason: most desks and office chairs are really not designed with posture in mind. Most humans love “the slouch.” It’s just so darn comfortable! (Or at least we think so until it starts causing us pain). Chairs that encourage proper posture can be a bit uncomfortable at first, and many furniture manufacturers and companies that buy office furniture don’t want to hear their employees complaining about “uncomfortable” chairs, no matter how good they may be for posture. If you decide to get a chair that encourages good posture, be prepared for a period of transition. You may want to shift between your “normal” chair and new chair throughout the day in order to ease into your new seating arrangement. A kneeling chair has no back and puts you in a modified kneeling position. Your primary support comes still comes from the seat of the chair, but is also supplemented by support from your shins (tucked behind you at a slight angle). This type of chair is great for reducing spinal compression, and reduces stress and tension in your lower back and leg muscles, though the position might take some getting used to. 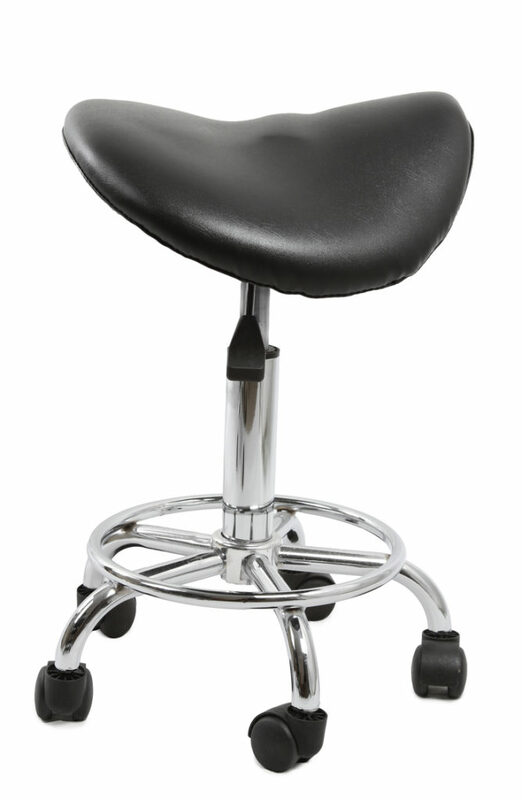 The saddle chair falls somewhere between sitting and standing, allowing you to sit straight up like you were riding a horse. It is difficult to slouch forward in this chair without tipping over, which is ideal for helping practice good posture while strengthening your back muscles. One of the most recognizable alternative chairs is the exercise ball, which has been depicted heavily in pop culture and films. One of the best features of the exercise ball is that it encourages you to keep moving while you’re seated while making slouching difficult. It’s ideal for anyone with good balance (this is important!) and who gets antsy sitting still at their desk. You can simply place an exercise ball directly on the floor, or get an exercise ball stand to provide more stability (fixed stand) or mobility (stand with wheels). 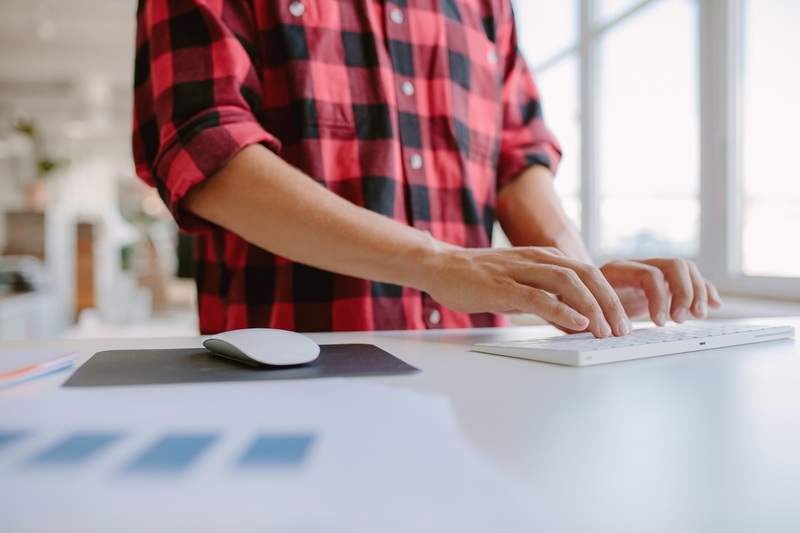 Standing desks are one of most well-known desk alternatives, and with the advent of adjustable sit-stand desks, more people are trying this posture-promoting work option than ever before. Your monitor should be at eye level and the same distance from your eyes as the monitor is from corner to corner. Don’t hunch your shoulders and do you keep your head straight, or else end up facing the same kind of back pain that you might experience with a traditional chair-desk approach. Additionally, don’t hold one position standing up for long periods of time. Shift your weight from leg to leg and even rest one leg on a stool or chair if you need to. Many people also do lunges and other light aerobic stretches and exercises while standing. January is posture month at Apple Healthcare! Is bad posture causing you pain? Call us at 865-769-9685 to schedule an appointment with our chiropractic staff today. Also, ask about our Strong Posture Program–an exercise-based, customizable program to help you gain and keep great posture! Follow us on Facebook, Twitter, or Instagram, or subscribe to our Newsletter for more information.